Ultravox – latest from the band – Chain D.L.K. We’re very happy to announce that Robin Simon is confirmed as a special guest at John Foxx’s show at The Roundhouse in London on Saturday the 5th of June. The former Ultravox guitarist will be performing on a selection of material including songs from the band’s pioneering 1978 album, “Systems of Romance”. Further information, including a schedule of the days events, will be announced soon. Please note that The Roundhouse has a theatre licence which enables anyone up to the age sixteen to also attend as long as they are accompanied by an adult. Firebrand have launched a new merchandise store, where you can buy Return to Eden 1 & 2 tour merchandise. Not quite all of the merchandise items appear here as they will have sold out on tour, but a good range is available. 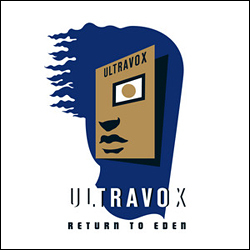 Click here to to the Firebrand Ultravox Return to Eden tour merchandise store. Not only that, but Firebrand have a brand new product – a Vienna 30th Anniversary Numbered Presentation Disc. It’s a limited edition of 100 and Firebrand are giving us the very first one, no.1 of 100, to give away. All you need to do is to order from the Store between now and midnight GMT on 31st May and you will be entered into the draw. The winner will be announced in the first week of June at Ultravox.org.uk. Midge has been posting some interesting Tweets on Twitter, regarding the recording and possible release of more live material from the Return to Eden tour. You can find him at www.twitter.com/midgeure1. Due to popular demand, the 2009 Special Edition 2CD+DVD live album, Ultravox Live at The Roundhouse has been given an extremely limited repressing of 300 copies. Yes, that’s just 300 extra copies worldwide, after which only the single-CD Highlights edition will be available (no DVD, and the audio CD is not quite the full concert). THERE ARE NOW ONLY AROUND 100 COPIES LEFT, SO DON’T MISS OUT! PLEASE NOTE: make sure you’re ordering the ‘+DVD’ version – if it doesn’t say this in the description, it’s sold out and you’re looking at the single-disc Highlights version instead! If you enjoy the Official Ultravox website, please remember that you can help us by using ourAmazon search box to purchase anything at all, either for yourself, for gifts or even gift certificates and DVD rental subscriptions. If the search box doesn’t show in this email, this direct link will take you there instead. Once you reach Amazon.co.uk, you can continue shopping as normal and we will get a small commission on anything you buy within 24 hours of your initial visit. Thank you! We feature some John Foxx stories on this Ultravox list, but tend not to duplicate everything sent out by our sister site, Metamatic. If you would like to keep up to date with ALL the John Foxx news as and when it happens, send an email to subscribe@metamatic.com to be added to Metamatic’s mailing list. Midge Ure is currently performing a rolling set of solo live dates which are constantly updated, so to keep up to date with these, please keep checking the News page on his website. Don’t forget that Ultravox.org.uk has a thriving Forum – so if you haven’t already, go to the Forum summary to join in the fun! If you’re in a hurry, you can also go straight to the active topics in the last 24 hours. News stories often break here first, before being sent out to the mailing list – so it’s worth checking out. See you there! Copyright (C) 2010 Extreme Voice, the Official Ultravox Website. All rights reserved.